Another one of my go-to outfits for those days when I have meetings, errands and dinners to go to without much time on my hands. The key is to look presentable yet comfortable. What is your ultimate outfit when you need to look good throughout the day but don't have time to change? Feel free to share your ideas and tips. Also, I wanted to share my little interview for Washington Life Magazine with you. Many thanks to Laura for her time and patience :) You can read the interview HERE. Когда на один день запланировано много дел, и нужно выглядеть уместно в любой обстановке, - в таких случаях я выбираю примерно вот такой наряд. Самое главное - выглядеть презентабельно, но в то же время комфортно. А как вы одеваетесь, когда много дел, но выглядеть нужно на все сто? Буду рада вашим подсказкам и идеям. А ещё хочу поделиться небольшим интервью (на англ.) для Washington Life Magazine. Большое спасибо Лоре за время и терпение :) Интервью можно прочитать здесь. Elena, I read the interview and I'm so happy that you don't wear fur! This outfit looks as simple as it is beautiful. Beautiful simple + sophisticated look. This is so amazing! love simply outfits! I love your style, similar to mine. I also enjoyed your interview, thakns for sharing! I totally love your outfit! Classy, like always. Yeay! Outfit post. I love your simple, minimalistic yet elegant look. Already read the interview post. Its cool and look so fun. Love the part when you need to fill the unfinished sentence. or choose from 2 things. I love your outfit - it looks perfect on you. Very Olivia Palermo style. Minimalist but quite chic. simple and clean outfit.Love it. Soo simple and soooo beautiful! I love those heels so much! You make simple look SO GOOD! UGH. So jealous. As your blog says: your are classy but fabulous at the same time! We really love your look! Just found your blog, really like your style. Following. 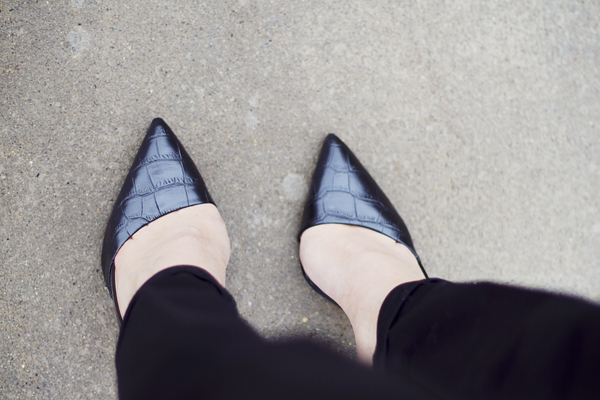 If it's going to be a long day I tend to wear flats, Ferragamo's look stylish like heels. If it's rather short, I go with heels and print trousers. I also tend to add some statement jewellery. Amazing outfit, perfect for so many occasions!